With half of the conference season in the books, let's take a look around the Big Sky and assess awards, all-conference teams, and of course predictions for the rest of the way. - Will Cherry broke his foot late in the offseason. Though he came back just before conference play started, he is still getting in the groove to play with the consistency that he did last year. 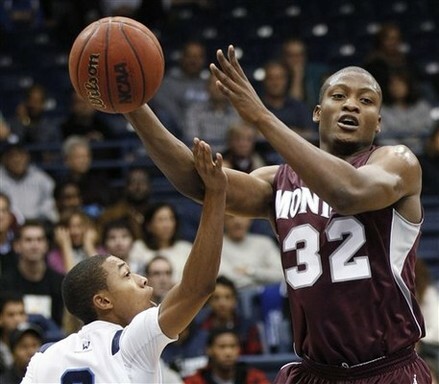 - Kareem Jamar, who is 6’5’’ and plays the 2 or 3, is the Grizzlies best offensive post player and best rebounder. - Their defense is not at the level we have become accustomed to seeing from Montana over the past few years, and it is arguably the worst Grizzlies defense since 2008. - They don’t have an inside scoring threat or above average rebounder on the frontline (their best 4/5 man is Mathias Ward, who is at his best as a jump shooter). Yet, when you look at the standings, they are 10-0 and again in control of the Big Sky race. As if there was any doubt about Wayne Tinkle’s coaching ability. 2. Weber State (8-2, 17-3) - Defensively, they don't force a lot of turnovers, but they do everything else well. Teams aren't able to take a lot of threes against them, and are shooting just 27.9% when they do. WSU has been the best rebounding team in the conference, with Joel Bolomboy being among the best defensive rebounders in the country. WSU has been good blocking shots as well. With all that said, their defense has been even better than their offense. Let's just say Montana is the favorite heading into the second half of the year because they have an in on home-court advantage, but this race is far from decided. 3. Montana State (6-4, 12-8) – The Bobcats have been the surprise team of the Big Sky so far, with a win over Weber State and being seconds away from beating Montana (in Missoula). They are avoiding turnovers at a great rate, and doing a good job of turning people over. A key for them is if Antonio Biglow continues to embrace his role off the bench, where he is a great weapon on both sides of the floor. Marcus Colbert continues to develop and get better, which has been huge for Brad Huse. They have to be careful of a second half letdown, as that has been MSU’s calling card over Brad Huse’s tenure. 4. Sacramento State (5-5, 11-9) - They have as much balance as any team in the conference not named Weber State. All of their regular starters are capable of scoring 15 points in a given game, and a couple of their bench guys are as well. The key is their senior laden frontcourt - Konner Veteto, John Dickson, Joe Eberhard. Those guys are good enough to carry the Hornets on a nice postseason run, but they are just inconsistent enough that you have trouble completely trusting them still. 5. North Dakota (5-5, 10-10) - After a 4-10 start, they have 4 of their last 5 thanks to the schedule turning in their favor and the return of Troy Huff. After last year, the question marks were in the frontcourt. We thought they addressed those with their recruiting class, but it hasn't worked out that way. Alonzo Traylor is academically ineligible, Ryan Salmonsen is redshirting, and Jaron Nash was granted eligibility by the NCAA (like he should have). This again leaves them reliant on their guard play, but that formula has worked out for them in the past. However, as down as the Big Sky is, it's still a big step up from the Great West. 6. Portland State (3-7, 8-12) - As has been the case the past few years, they are still a bad defensive team, with their AdjD ranking 335th in the country. This is not a good sign especially considering that they are one of the most veteran teams in the country, with no freshmen and most of their rotation players being upperclassmen. They have had a tough schedule, and six home games in the second half should serve them well, since they are 5-2 at home and 0-10 on the road. 7. Northern Colorado (3-7, 8-12) – I keep waiting for them to breakout, but they keep losing to teams that arguably don’t have the talent they do. After looking fantastic against Portland State and Eastern Washington, they went on the road and lost to Northern Arizona (on a buzzer beater) and Sacramento State. They need to figure out how to win on the road. Fortunately, the schedule does get easier, with 6 home games coming in the second half. If they can win five of those (which is definitely do-able), then they will still be in good shape to make the Big Sky tournament, where they have the personnel to be dangerous. 8. Southern Utah (5-5, 7-13) – Why the big drop that I am projecting? The schedule is about to get tougher. In the second half, they have 4 home games and 6 road games… and the home games are against teams like Montana, Montana State, and Sacramento State, who are three of the four or five best teams in the Big Sky. With the way they turn the ball over (bottom ten in the country) and foul people (nobody’s opponents shoot more free throws), I think they may be due to regress a little bit. However, people (myself included) have been underestimating them for much of the year, and I get the impression they thrive on that. 9. Northern Arizona (4-6, 7-13) - Offensively, they are dependent on Gabe Rogers and DeWayne Russell for a lot of their offense. Defensively, they continue to struggle a bit. They give up more points than anyone else in the Big Sky, though that is partially due to their fast pace (there are worst defensive teams). They would be wise to do what they can to get more shots for Max Jacobsen and Gaellen Bewernick, two high efficiency players. They play you hard every game. 10. Idaho State (3-7, 6-14) - They continue to play at one of the slowest paces in the country with one of the worst offensive efficiencies, but teams have had trouble with their zone defense this year. Two of their wins have been by a point, but they also almost beat Northern Arizona and Montana State. They don't have the talent to match up with a lot of the conference at this point (though Bill Evans is bringing good players in), but they always fight hard. That will steal them a few more wins. 11. Eastern Washington (3-7, 6-14) – There have been plenty of growing pains, but that was to be expected this year. Jim Hayford and the Eagles give significant playing time to three true freshman, true sophomore, and a redshirt sophomore (transfer Martin Seiferth). All three of the freshmen – Venky Jois, Daniel Hill, Thomas Reuter – seem to fit Hayford’s system very well, and this experience should pay dividends down the road. At least, that is the hope. For the rest of this year, they are still too reliant on the three-point shot (which is not always terrible, but not ideal when you are only shooting 34%), don’t defend very well, and don’t force many turnovers. That leads to an up and down year, which looks right for this group. - Kareem Jamar* - Jamar has been as good as ever, increasing his scoring, rebounds, and assists this year while keeping his turnover rate low even with increased ballhandling duties at the start of the year. He doesn’t necessarily wow you during the game, but you look at the end of the day and he’s got 15 points, 6 rebounds, and 5 assists. He pressed a bit early in the year, but has found his groove. - Scott Bamforth – Bamforth has been key for Weber State, continuing to stake a claim as the best shooter in the Big Sky (91% FT, 44% 3PT). He has been excellent taking care of the ball as well. The Wildcats have the potential to be even better next season, but Bamforth is a guy they will miss. - Dylan Garrity – The assists numbers are down from last year, but overall Garrity has been a better player. He’s been really good shooting the ball, with a ridiculous 58% on twos and a stellar 41% from downtown, big improvements over his freshman year. He may not ever be an elite defensive player, but he’s not far off from being the best offensive player in the conference. - Davion Berry – There was a lot of hype for Berry before the season began, and he has lived up to it. He shoots 2% on twos and 42% on threes, excellent percentages for a SF. He is a very good passer with a nice assist rate, and contributes on the boards as well. Berry has matched or exceeded the expectations that the team and fans had for him coming into the season. - Derrick Barden – He started a little bit slow, but his talent and athletic ability is evident when you watch him. Over his last six games, he is averaging 11.5 rebounds per game, including almost five per game on the offensive glass. He is not an extremely polished offensive player, but he gets a lot of easy baskets with his great rebounding ability and quickness. All this despite the fact that he is really probably only 6’3’’. - Mathias Ward – You still wish he rebounded better, but he is great at what he does. He is a great midrange and free throw shooter, and has slowly built up his three-point stroke throughout his career. He can score an occasional bucket inside as well. He leads the Grizzlies in scoring and opens up a lot of driving lanes because you cannot help off him. - Jackson Stevenett – He is second in the conference in scoring, and just seems to know what to do when he gets near the basket. He is also a solid rebounder for his size. SUU is a tough squad this year, and Stevenett is the perfect leader for that. He simply gets the job done every game. - Aaron Anderson – He was forced to carry the load for UND for a lot of the time that Huff was injured, and he has played well. The increased usage has dipped his shooting percentages a bit, but he has compensated by getting more assists and turning the ball over less, obviously a winning combo. Huff and Anderson is one of the best duos in the Big Sky. - Will Cherry – By the end of the year, Cherry will almost certainly be on the all-conference first team. But, he has still played under 50% of the Grizzlies’ overall minutes, which makes him a little less valuable in my book than some of the other guys ahead of him. His shooting percentages and steal rate are still way down as well. He still impacts the game in a lot of ways, but I will wait for a healthy rest of the year to put him on the first team. - Venky Jois – He has come in as a freshman and surpassed all expectations, leading the conference in rebounding while scoring 13 points per game. He shoots over 50% from the field, makes his free throws, and is a good shot blocker. He is a great piece for Jim Hayford to build around. - Tate Unruh – For my money, Unruh is the best shooter in the Big Sky. He has also added a little bit more to his offensive game, as he has been better away from the ball (getting himself open), and a little bit better off the drive. One of my favorite Big Sky players to watch. - Troy Huff – Like Will Cherry, I think there is a great chance that Huff will finish the year higher than I have him here. Over the past month, you could argue that he has been the best player in the conference. However, he has played just over 40% of the team’s minutes for the year (because of a jaw injury that kept him out for an extended time). That’s just not enough yet for me to put him on one of the top two teams yet. - Kyle Tresnak – On a per minute basis, he should be higher. He is still scoring at an efficient rate, but even more impressively he had increased his rebounding rate by a huge margin compared to last year. He has been really good. But, even though he starts, he plays just over 20 minutes per game with the frontcourt depth the WSU team has. That makes it tough for me to put him above Jois, who plays 34 minutes per game. - Aaron Moore – He was the toughest omission from the top two teams for me, as Moore has been really good in the first half. He is in the top 8 in both OR% and DR%, all the while being efficient scoring the ball. Moore has been a great find for Tyler Geving, surprisingly being the best Vikings player so far this season. - Gabe Rogers – He leads the Big Sky in scoring, but he has been a volume shooter. He takes eight threes per game, but shoots just 30% from there. He is only at 40% on twos. Part of all the shots is because NAU doesn’t have a lot of guys able to create their own shot right now, but Rogers have been much more of a volume scorer rather than leading the conference with any type of efficiency. Where do you agree or disagree? I disagree with keeping Troy Huff off either of the all-conference teams. He's played in all but one Big Sky conference game, and not many teams have had an answer for him. That's a fair way to look at it. When I came up with the teams, I was considering their contributions for the whole season, not just conference games. So even though he missed just one conference games, he also missed almost all of the non-conference slate. Maybe it's just me, but I would think a team termed "All Conference Team" would encompass games played within the conference, of which he's missed one game. I see it as "best players in the conference" rather than "best players in the conference during only conference games." Another Hornet should be on the honorable mention list somewhere. Dickson (13.6 ppg, 6.0 rpg), McKinney (13.2 ppg, 4.0 rpg, 2.7 apg) or Veteto (11.4 ppg, 6.4 rpg). Not many big men in the league this season means Veteto’s inside presence is nice to have, but personally I’ve been impressed with McKinney and his athletic ability as of late. I hope he keeps it up because the Hornets are going to need it for a strong finish. It probably pains anyone to have to admit this, but Stallon Saldivar plays entirely above his talent level every game. How many other players have had triple doubles this year to go with his double doubles. How many other players dish out assists like he does, while also pulling in 5+ rebounds a game average? He ain't pretty, he isn't athletic, he isn't tall, he isn't strong, he isn't fast, but in terms of what he means to his team, you have to put him on the honorable mention team...because, well, that would be a fitting honor.